Published: June 27, 2014 at 01:37 p.m. 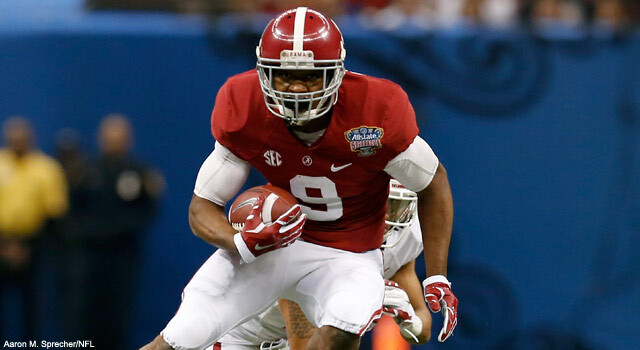 Updated: June 27, 2014 at 02:01 p.m.
Alabama wide receiver Amari Cooper has the ability to become a No. 1 receiver in the NFL. Whenever a young player makes key contributions for a national championship contender, NFL scouts tend to pay closer attention to his development because there is a strong belief that big-time players will always excel on the biggest and brightest stages. That's why the league was buzzing a year ago about the talent and potential of Alabama WR Amari Cooper after he helped the Crimson Tide secure a BCS national title on the strength of his scintillating play on the perimeter. The 6-1, 202-pound playmaker totaled 1,000 receiving yards on 59 catches with 11 touchdowns despite being a first-year starter in a complex pro-style offense. The performance, production and poise displayed by the standout pass catcher led many to tout Cooper as the top receiver in college football prior to the 2013 season, with scouts closely monitoring his growth as a playmaker and leader to see if he has the goods to develop into an elite receiver at the pro level. Elite receivers in the NFL are not only exceptional athletes, but they are masterful route runners adept at executing every route in the book. Cooper certainly looks like a blue-chip prospect at the next level based on his superior athleticism and superb route-running skills. He capably runs a pro-like route tree in Alabama's offense, exhibiting outstanding balance and body control getting in and out of his breaks. Additionally, Cooper flashes exceptional short-area quickness running away from defenders at the top of routes, leading to significant separation on intermediate and vertical routes. Most impressive, Cooper displays exceptional patience and timing as a route runner. He patiently sets up defenders with a variety of stems and fakes at the top of routes that make it nearly impossible to anticipate his next move. Consequently, Cooper frequently shakes free from tight coverage despite being the focal point of most defensive game plans around the SEC. If I had to cite a flaw in Cooper's game, I would point to his occasional struggles against press coverage. Studying Cooper's play against Virginia Tech, I noticed that he had a tough time separating from the Hokies' Kyle Fuller on the perimeter. While Fuller is certainly an elite defender, as evidenced by his selection by the Chicago Bears with the No. 14 overall pick in May's NFL Draft, Cooper must be able to win consistently against the "hug and mug" tactics used by top cover corners to convince NFL scouts that he is a potential No. 1 receiver at the next level. If Cooper can continue to refine his release tactics and master the art of "stacking" defenders at the top of routes, evaluators will feel better about his chances of dealing with physical corners as a pro. The top receivers in the NFL excel at snatching balls outside of the strike zone. Elite pass catchers easily track and adjust to errant throws, while also exhibiting strong hands and superb hand-eye coordination. Cooper is a natural pass catcher with outstanding ball skills. He easily plucks the ball out of the air with his big mitts and doesn't appear to have any problems wrestling the ball away from defenders on contested catches. Cooper's impressive collection of acrobatic catches throughout his career alleviates any concerns about his hands or ball skills, but I must acknowledge the surprising number of drops that showed up on tape in 2013. In a three-game breakdown (Virginia Tech, Oklahoma and Auburn), I noticed Cooper flubbed a handful of catchable passes that should be routine grabs for an elite receiver. While I attributed those miscues to brief lapses of concentration and focus, Cooper must reduce his number of drops this fall to keep scouts from questioning his status as an elite pass catcher. The pass-centric nature of the NFL has made it imperative to have receivers with exceptional running skills on the roster. Offensive coordinators are increasingly using short passes and bubble screens to replace rushing attempts in today's game. Thus, elite receivers must be able to turn short passes into big gains on the perimeter to command respect in meeting rooms around the league. Cooper is a dynamic runner with the size (6-1, 202), strength and athleticism to thrive in a system built on "catch and run" passes on the perimeter. Studying the tape, I was impressed with his ability to turn bubble screens and quick throws into first downs by running around or through tacklers in space. Cooper's powerful running style and physicality overwhelm smallish corners, leading to big plays on reverses (see Auburn) and short passes in the open field. With Cooper's underrated speed and burst enhancing his electric running skills, it's easy to envision the Alabama star blossoming into a superstar at the next level in an offense that places a premium on RAC (run after catch) and explosiveness on the outside. Pass catchers capable of producing big plays in the passing game are coveted in the NFL. Offensive coordinators at the next level harp on the importance of "explosives" (runs of 10-plus yards or completions of 25-plus yards), so it's important to stockpile rosters with electric playmakers on the perimeter. Cooper certainly qualifies as a big-time playmaker based on his knack for delivering explosive plays for the Crimson Tide. The junior standout is averaging 16.7 yards per catch throughout his career, with 15 touchdowns in 25 career games. Those numbers are certainly impressive for a No. 1 receiver, particularly one playing in a conservative offense that views the passing game as a complementary tactic. Watching Cooper perform on tape, I believe he is a dynamic receiver capable of delivering big plays in the passing game in a variety of ways. I've already outlined his explosive running skills, which make him a home-run threat on screens and short passes, but it's superb route-running skills on vertical passes that makes him a dangerous threat on the outside. Cooper is at his best running double moves (stop-and-go/out-and-up routes), post-corners and fades down the boundary. He not only has a knack for slipping past defenders on those routes, but he displays the balance, body control and burst to take it the distance after the catch. Given the importance of big plays and touchdowns in the pro game, Cooper's ability to deliver "chunk" plays in the passing game will definitely enhance his value to teams in need of a true No. 1 receiver. It takes special skills to thrive in the NFL as a No. 1 receiver. Elite pass catchers consistently make their mark in big games despite facing a host of tactics designed to minimize their effectiveness. Cooper has definitely shown the ability to thrive as the primary option in the Crimson Tide passing game, particularly in big games. Looking at his resume over his first two seasons, Cooper has delivered seven 100-yard games in 25 contests, with huge totals against Georgia (2012 SEC Championship Game; 8 for 128 yards with 1 TD), Notre Dame (2013 BCS Championship Game; 6 for 105 with 2 TDs) and Oklahoma (2014 Sugar Bowl; 9 for 121 yards) in key contests. Those numbers accurately reflect his dominance in each of those contests, while also showing NFL scouts that he has the ability to take his game to another level in a big game. As a scout, I always paid attention to how well players performed in rivalry games, conference championship games and bowl games because the intensity mirrors an NFL game. With Cooper thriving in those environments throughout his career, I'm confident that he will continue to excel as a No.1 receiver as a pro. The hype has been building around Cooper's game since his breakout performance as a freshman, with scouts and observers touting him as the top receiver in college football prior to the 2013 season. Although his production and performance fell short of expectations a season ago, NFL scouts should be excited about his potential based on my film study. Cooper is a talented No. 1 receiver with a fundamentally sound game that should allow him to quickly blossom into an elite receiver at the next level. While I'm not ready to proclaim him a top-10-caliber receiver at this point, I certainly believe he is already more polished than Sammy Watkins and Mike Evans as a route runner, and exhibits the explosiveness to be a difference maker in any system. If he continues to refine his overall game and displays better consistency as a pass catcher, I can see Cooper thriving as a Roddy White-like playmaker as a pro.